Re: New smoking guns in Apollo moon photos! Here are some smoking gun photos I found that will make you slap your forehead in embarrassment. You will probably be too embarrassed to speak after this. Take a good hard look at these photos. This will be the clincher that will change your mind if you are on the fence or an Apollo believer. The famous photo of Buzz Aldrin standing in the spotlight is a giveaway in that he is being lit up in a spotlight from alleged sunlight while the ground around him is in darkness! How can the sun put a spotlight around a particular person like a stagehand pointing a spotlight on an actor or singer on stage?! This was obviously a major screw up, and NASA was reckless for thinking that no one would notice or that they could get away with it. In fact, it was such a blunder that NASA even tried to cover it up by brightening the rest of the surface in subsequent versions of it. Why would they do that if they had nothing to hide? Apollo defenders can’t explain this at all, so they’ve resorted to deception by claiming that the edited version is the original. But Jarrah White proved unequivocally that the spotlight version is the original one by showing newspaper clippings from 1969 which showed that one in his YouTube video “Moonfaker: Posing for Portrait”. Important! Here is a much larger version that I want you to open in a new window and look at closely, because it contains a BIG NEW SMOKING GUN! View this image at its original size, and notice that behind the astronaut the edge of a WHITE CLOTH CANVAS can be seen placed over the dirt! This is a MUST SEE smoking gun that I discovered but don't see mentioned on any other sites yet! In possibly yet another slip up by NASA are images of the 65 million dollar lunar rovers seen with no tire tracks on either end of it! Was it lowered down from above? It would seem that whoever directed this must have been in a rush on a tight schedule. It's just mind boggling that NASA could have been so careless and stupid to let the photos out in the public domain in the first place let alone continue to be published all these decades later isn't it ? really? wrote: Why Jarrah White is wrong. While looking further for more info on the fellow I noticed scepcop made a few other mentions on other sites. What perplexes me is why scepcop puts so much faith in Jarrah, a fellow whose age as indicated by photos wasn't even alive until well after the last Moon mission. How can such a self professed expert and youngster have so much knowledge from second hand sources ? It's no different than what scepcop is doing. I think he's done very well for a young guy a generation removed from the event -- especially his moon rocks and radiation analyses, from original sources. And he's also doing a B.Sc. in astrophysics I understand. Shows a lot of gumption to specialise in this area AND break new ground so long after the original deception, and using aged sources. Just another sad red herring diversionary argument from a puling unscientific pseudoscep. How many does that make now? really? wrote: It's just mind boggling that NASA could have been so careless and stupid to let the photos out in the public domain in the first place let alone continue to be published all these decades later isn't it ? All plausible deniability stuff, I suppose. The true scientists are finding a million holes in the official story. NASA's response has been to employ spin doctors to cover it up. Arouet wrote: All the pictures (including the one you think was lightened) have darker areas. I'm not sure how the different copiers would deal with it. I know photocopiers can produce dramatically different results of the same image given different settings. But I'm not an expert in this. But we're looking at the original colour high-def image with the same problem. Arouet wrote: I'll take a look at what you posted Scepcop, though I honestly haven't looked into the moon landing much. But just to note: its not embarassing to change one's mind based on additional evidence. That's good skepticm - not a cause of shame. wow, that's really impressive and, um, scientific of you -- maybe a lot of the scientific non-pseudoscep posters here have already evaluated a good deal of the evidence and hence drawn their sceptical conclusions of the official line???? 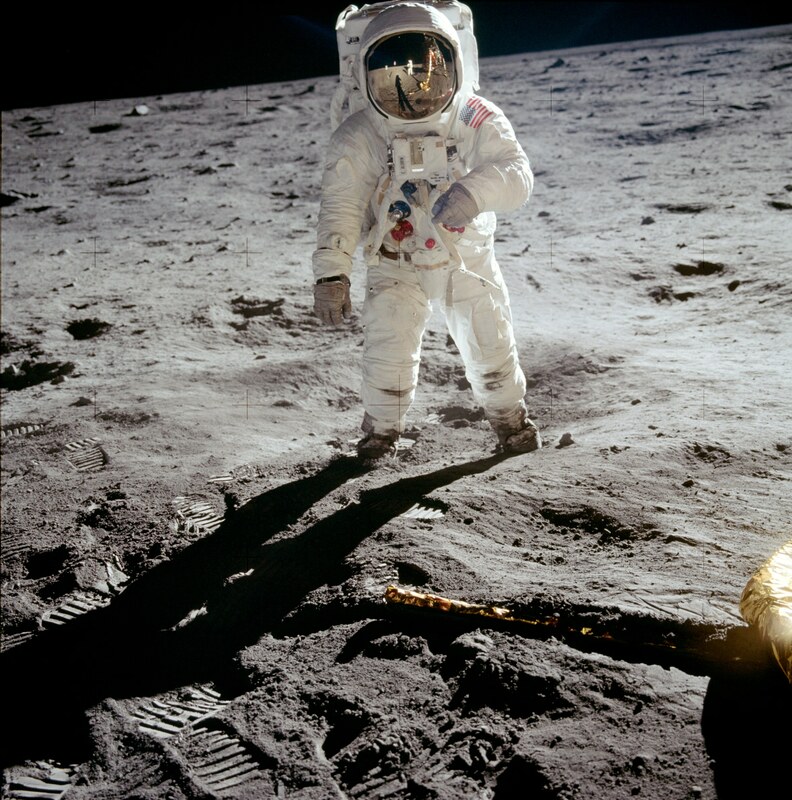 No, no, as we know, NASA issued all the astronauts with brooms to take to the moon to help them sweep up the moonscape for more aesthetic photos. Just like they let one idiot supposedly take a hardware store hammer and a feather with them to demonstrate 'the airless moon' by dropping them together. Don't quite know why that astronaut felt that he had to 'prove' airlessness in that fashion, it's actually a bit of a smoking gun in itself. Quite a high end scientific experiment, that one. Except that you can do the same thing on earth and the end result is indistinguishable with air as without. Misha wrote: I just caught this in Yahoo News. Jarrah White on moonfaker.com goes point by point on the moon rocks issue. What do you mean? That article is not about Jarrah White and doesn't even mention him. I see the confusion. My Jarrah White comment is independent of the Yahoo article. It was meant for you and the forum members to investigate in lieu of the Yahoo article. Clergymen, historians, researchers and what not might not have been alive during particular events in history. I don't think we should discount a person's research if it is lucid and thorough according to one's age. Whether Jarrah White is a young man or an old man makes no inherent difference provided he offers transparency and the proper means of explaining the research at hand. Yes, we may question Jarrah's sources and challenge him point by point. That's healthy. However, we can do the same with NASA and their sources. I think Jarrah has done this very effectively. I think Jarrah has done a fine job asking the questions which NASA obfuscates. Moreover, my faith is looking at the full spectrum available to any thesis that comes along. I think Scepcop is doing just this. I have looked over many of his posts and see a wide variety of sources he offers on all subjects. Becoming an expert in astrophysics doesn't make you an expert in space travel engineering. Gumption you say, he's a youngster who thinks they knows better, but ends up sounding stupid with all of the crazy fabricated observations and because of such fabrications he's becomes so very easily dismissive. The same with you et al. I see you missed or haven't read my post. I have watched ALL of Jarrah White's moonfaker.com videos. I have also read books on the same subject to balance out what White asserts. I think White has handled his detractors as a gentleman and has shown great patience. At this point in my research on the subject it is NASA who has done a lot of fabricating. Yes, I respect authority and their respective disciplines. However, I do not think authority has respected very sound questions coming from individuals who have challenged NASA's record. Authority must understand that not everyone falls within Milgram's experiment of compliance. It matters not one bit if White is a gentleman. What matters is this fellow presents dumb arguments. Meaning he has the inability to look at evidence and learn that we did go to the Moon. My argument isn't about upholding the status quo of authority, it is solely concerned with pointing out the unmitigated expertise of some persons that feel they have a clear perspective on the truth especially someone who does not have a grasp of history of the space race and lived through the space race. May I ask your age ? Is it over 30 and if so by how many years or decades ? Really, what is your age? And what "if" my age is 28? really? wrote: It matters not one bit if White is a gentleman. What matters is this fellow presents dumb arguments. Meaning he has the inability to look at evidence and learn that we did go to the Moon. Misha wrote: Really, what is your age? And what "if" my age is 28? I'm a lot older than you. Age matters because those that did not live through those events sometimes have a difficult time excepting what has become history. You are entitled to your own opinion but not your own facts. SydneyPSIder wrote: I think he's done very well for a young guy a generation removed from the event -- especially his moon rocks and radiation analyses, from original sources. And he's also doing a B.Sc. in astrophysics I understand. Shows a lot of gumption to specialise in this area AND break new ground so long after the original deception, and using aged sources. I'm sorry to say that's complete and utter drivel, and empty of any substance whatsoever.